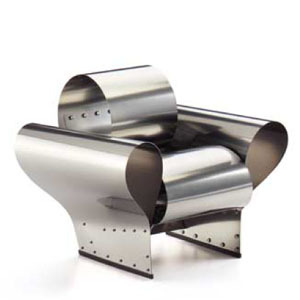 Ron Arad Well Tempered 1986 Vitra Miniature Chair. Vitra "Well Tempered" original miniature chair by Ron Arad. This amazing and highly detailed miniature is an exact copy of the original large version! The miniature comes in a wooden box with a brochure which provides art-historical information on the background to the design, biography of the designer, and the production history of the respective chair. Miniature Well Tempered Chair, Designer: Ron Arad, 1986. The Well Tempered Chair (it takes on the temperature of the user), is full of contradictions. The combination of the inviting form of an armchair and the material - spring steel - create a surrealistic-looking object, which invites one to sit down yet is simultaneously unwelcoming. Size: 5.91" x 7.09" x 5.91" (15 x 18 x 15cm).